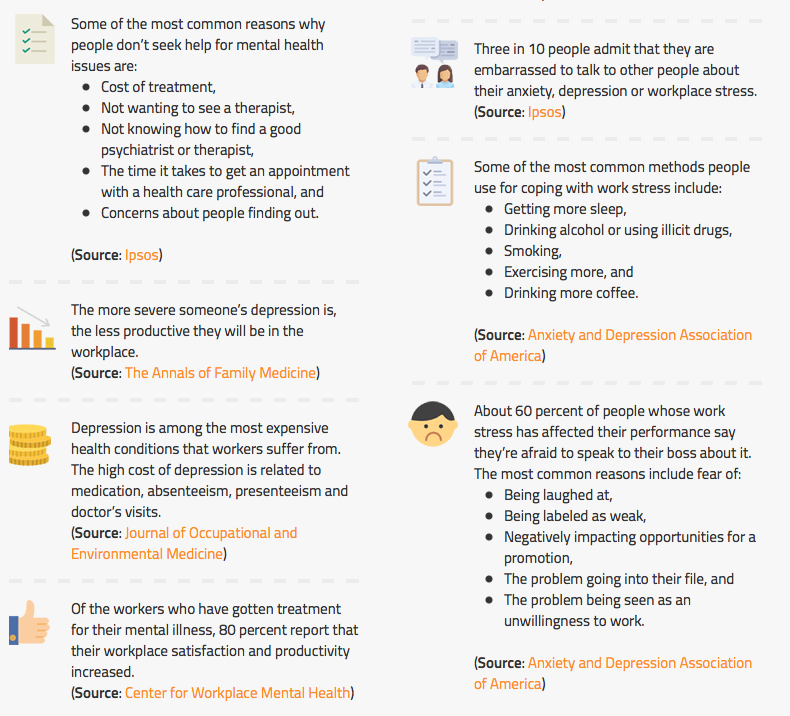 This is a leading resource on mental health at work. Our MissionThe Center for Workplace Mental Health, formerly known as the Partnership for Workplace Mental Health, provides employers the tools, resources and information needed to promote and support the mental health of employees and their families. While treatment works and is cost effective, many people who need help are not getting it, despite the availability of services and supports through employee assistance programs (EAPs) and mental health benefit coverage. Our team works with employers, business groups on health, health-focused coalitions and other strategic partners to solve challenges and highlight innovative approaches to improving workplace mental health and making it a higher organizational priority. The Center engages employers and our other partners in eliminating stigma, reducing barriers to care, raising broader mental health awareness, improving and implementing mental health programs, and designing benefits that improve employee mental health. This work is done through turn-key programs, toolkits, employer case studies, topical resources, publications and more. Better workplace mental health policies and practices improve employee productivity and quality of life for all those affected by mental health issues. Join our growing network of more than 10,000 employers and learn how you can better serve your employees' mental health needs. ​From an executive’s perspective, it makes good business sense to ensure that your organization’s workforce is healthy, both physically and mentally. 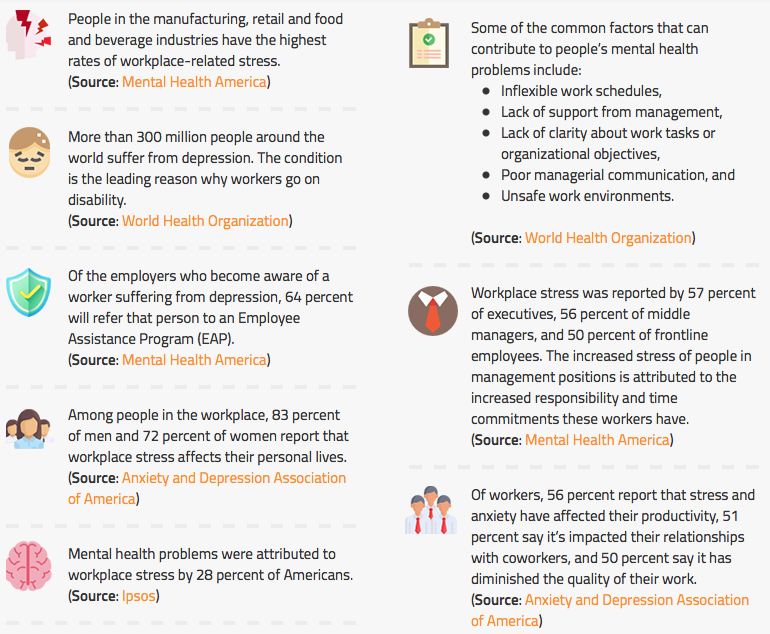 Currently, many workplaces overlook mental well-being, meaning that people with mental health conditions go untreated. Some may even worsen under the expectation that individuals can recognize and seek appropriate support or professional services to overcome issues like depression or anxiety by their own initiative. ​However, studies indicate as much as a 10-to-1 return on investment in mental health training programs – to reduce stigma, train managers and improve organizational culture – pointing to the fact that addressing workplace mental health is not only an ethical priority but a business imperative. Link to the full story on Forbes. Experts tell us that one in four adults will struggle with a mental health issue during his or her lifetime. At work, those suffering — from clinical conditions or more minor ones — often hide it for fear that they may face discrimination from peers or even bosses. These stigmas can and must be overcome. But it takes more than policies set at the top. It also requires empathetic action from managers on the ground. We count ourselves among those who have wrestled with mental health challenges. One morning a few years ago, in the midst of a successful year, Jen couldn’t get out of bed. As a driven professional, she had ignored all the warning signs that she was experiencing Post Traumatic Stress Disorder (PTSD). But her mentor, Diana, could see something was wrong, and when Jen couldn’t come to work, the gravity of the situation became even clearer. In the ensuing weeks, we worked together to get Jen the help she needed. Diana understood Jen’s struggles because she had been there, too — not with PTSD but with anxiety. As the mother of adult triplets with autism and a busy job, she’d often had difficulty managing things in her own life. Throughout both of our careers, we have moved across the spectrum of mental health from thriving to barely hanging on, and somewhere in between. What we’ve learned through our own experiences is how much managerial support matters. That’s exactly what Jen said when a coworker told her that he was grappling with anxiety; it had gotten to the point where it was starting to impact his work and his relationships at home. He came to her because she’d been open about her own struggles. She listened to him, worked to understand what accommodations he needed, and told him about available resources, such as Employee Assistance Programs. Then she continued to check in to see he was getting support he needed and make it clear that she and others were there to help. How do you learn or teach the people on your team to address colleagues’ or direct reports’ mental health issues in the same way? Here are five ways managers can help drive a more empathetic culture. ​Pay attention to language. We all need to be aware of the words we use that can contribute to stigmatizing mental health issues: “Mr. OCD is at it again — organizing everything.” “She’s totally schizo today!” “He is being so bi-polar this week — one minute he’s up, the next he’s down.” We’ve heard comments like these, maybe even made them ourselves. But through the ears of a colleague who has a mental health challenge, they can sound like indictments. Would you open up about a disorder or tell your team leader you needed time to see a therapist after hearing these words? ​Encourage open and honest conversations. It’s important to create safe spaces for people to talk about their own challenges, past and present, without fear of being called “unstable” or passed up for the next big project or promotion. Employees shouldn’t fear that they will be judged or excluded if they open up in this way. Leaders can set the tone for this by sharing their own experiences, as we’ve done, or stories of other people who have struggled with mental health issues, gotten help and resumed successful careers. They should also explicitly encourage everyone to speak up when feeling overwhelmed or in need. ​Rethink “sick days.” If you have cancer, no one says, “Let’s just push through” or “Can you learn to deal with it?” They recognize that it’s an illness and you’ll need to take time off to treat it. If you have the flu, your manager will tell you to go home and rest. But few people in business would react to emotional outbursts or other signs of stress, anxiety, or manic behavior in the same way. We need to get more comfortable with the idea of suggesting and requesting days to focus on improving mental as well as physical health. ​Be proactive. Not all stress is bad, and people in high-pressure careers often grow accustomed to it or develop coping mechanisms. However, prolonged unmanageable stress can contribute to worsening symptoms of mental illness. How can managers ensure their employees are finding the right balance? By offering access to programs, resources, and education on stress management and resilience-building. In our marketplace survey on employee burnout, nearly 70 percent of respondents said that their employers were not doing enough to prevent or alleviate burnout. Bosses need to do a better job of helping their employees connect to resources before stress leads to more serious problems. Train people to notice and respond. Most offices keep a medical kit around in case someone needs a bandage or an aspirin. We’ve also begun to train our people in Mental Health First Aid, a national program proven to increase people’s ability to recognize the signs of someone who may be struggling with a mental health challenge and connect them to support resources. Through role plays and other activities, they offer guidance in how to listen non-judgmentally, offer reassurance, and assess the risk of suicide or self-harm when, for example, a colleague is suffering a panic attack or reacting to a traumatic event. These can be difficult, emotionally charged conversations, and they can come at unexpected times, so it’s important to be ready for them. When your people are struggling, you want them to be able to open up and ask for help. These five strategies can help any boss or organization create a culture that ceases to stigmatize mental illness. ​More workplaces are allowing time off for employees facing stress, anxiety or depression, but not all bosses are understanding of their workers’ needs. Even though mental health can often be a taboo topic, especially in the workplace, it appears that employees want their employer to champion mental health and well-being. The amount of money companies spend on the mental health of their employees has been rising rapidly. Employers plan to make mental health one of their top priorities in coming years, a new Willis Towers Watson survey finds. People with mental health conditions make six times as many emergency room visits as the overall population. Some employers are making the treatment of mental illness a top priority — on par with combating cancer, diabetes and other chronic ailments, according to a new survey of 687 companies conducted by Willis Towers Watson. Of employers surveyed, 57 percent said they plan to focus on mental and behavioral health to a great or "very great extent" over the next three years. Workplace stress isn’t uncommon, but when left unchecked, it can lead to bigger problems, such as depression and anxiety. When this happens, stress not only creates debilitating negative emotions, but it also results in lower productivity, the inability to concentrate on work and strained relationships with colleagues. This guide provides tips on how to make mental health a priority when on the job as well as information on how some organizations have made good mental health a part of their culture. Considering the amount of time people dedicate to their jobs, it’s important for them to be able to navigate the workplace in a way that reduces stress, rather than exacerbates it. The following tips can help workers alleviate the effects of the stressors they experience at work in order to improve their overall mental health. Know the signs of a problem.When people begin suffering from depression or anxiety, there will be changes in their behavior they should pay close attention to. Some of those signs may include taking longer to complete routine tasks, having difficulty communicating with coworkers and feeling the need to call in sick more frequently. As people experience these problems, they may begin to push themselves to work harder, which may eventually aggravate the issue. Make a to-do list.Feeling overwhelmed from a mountain of work can contribute to anxiety and depression, so making a to-do list can help people stay on track. Not only does this help people prioritize what needs to be done, it also allows them to feel better every time they check an item off. Drink water.People who are suffering from anxiety and depression often neglect basic self-care activities, including drinking water. Staying hydrated at work can go a long way toward helping people concentrate and stay centered, which may reduce the effects of stressors in the office. Avoid workplace gossip.Although some people use workplace gossip for entertainment, a way to bond with coworkers or to communicate their frustrations, in the long run, it can cause more stress because it lowers morale and strains relationships with colleagues. Venting about problems with a coworker, however, can be healthy as long as the conversation is done directly with that person and not third parties. Set small, manageable goals.When a workload seems unachievable, it can make people feel helpless and contribute to their stress and anxiety levels. Setting manageable goals can help break down big tasks into smaller ones so the work doesn’t feel so daunting. Add personal items to a workspace.Adding personal items to a workspace can help people feel better when they’re experiencing stress. When people can look at reminders of their loved ones, favorite pet or enjoyable hobbies, it can help them feel centered and positive as they think about the things that make them happiest. Identify triggers.Everyone has different triggers for anxiety and depression in the workplace — from doing a presentation to writing reports to going to a company function — so it’s important for people to track the situations that make them uncomfortable in order to prepare. Workers who aren’t sure what their triggers are can keep a journal of the things that have led to stress in order to identify them. Next, they should do things to relax before these triggers come up, such as stretching, doing breathing exercises or taking a quick walk. Get help.People who are having problems don’t have to suffer in silence. Mental health professionals can help those struggling with anxiety and depression develop the tools they need to cope with their stressful workplace, as well as prescribe appropriate medications as needed. What Are Companies Doing to Address Mental Health?